Mary is 53 years of age and has suffered from rheumatoid arthritis since childhood. 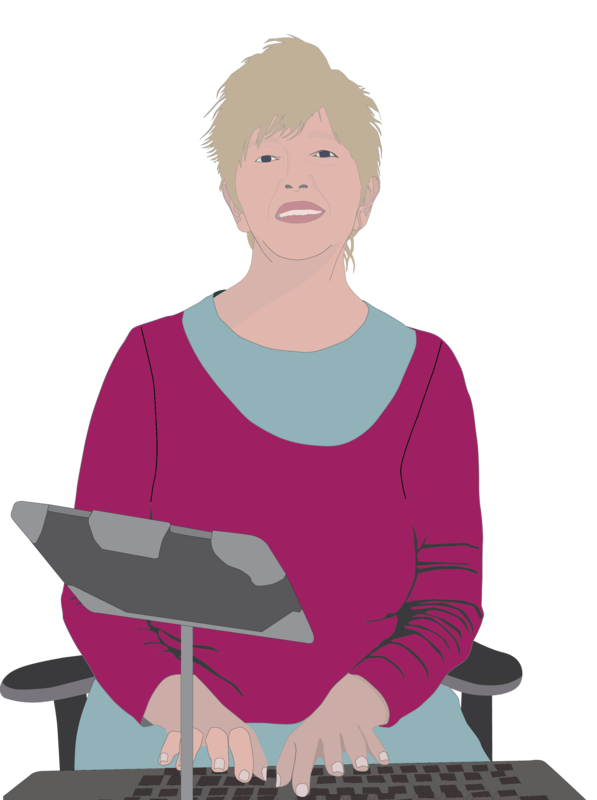 Mary’s symptoms of rheumatoid arthritis usually vary over time. Sometimes these cause mild discomfort. At other times, the symptoms flare up and can be very painful. Mary is a clerical worker in a hospital. She manages data entry for admissions and discharges. In addition, she is a clinical coder whose main duties are to analyse clinical statements accompanying admittance and discharge notifications and assign standard codes using a classification system. The data produced are an integral part of health information management, and are used by local and national governments, private healthcare organizations and international agencies for various purposes, including medical and health services research. Most mornings Mary suffers from stiffness that can often last more than an hour. She benefits from flexitime, which allows her to have more time to loosen up before work. When the rheumatoid arthritis flares up, Mary suffers from swelling, stiffness and pain, with occasional numbness and tingling in her hands, wrists and elbows. She also suffers from back and neck pain. This makes it difficult to move around and do everyday tasks. Flexitime also allows her to save up overtime for her holidays, which she can use when the symptoms flare up badly. For many years Mary used a standard desktop PC with mouse and keyboard. She had a keyboard with a gel pad to support her wrists and this allowed for reasonably effective data entry, mostly without serious discomfort. The mouse, though, was an altogether different story. It was difficult to grip. The lateral arm movements required, caused pain and discomfort in the wrist and upper arm. It was difficult to maintain a neutral posture while using the mouse and this aggravated the pain in the back and neck. When the price came down, the hospital replaced many of the desktops with laptop computers. The laptop worked well in some respects. Again Mary found that she could manage the keyboard quite well. The touchpad mouse reduced lateral arm movements and removed the need to grasp the mouse. However, the laptop was quite heavy and carrying it around caused Mary back and neck pain. To overcome this Mary, has recently acquired a lightweight tablet computer. However, it took a bit of getting used to. She found that the way she held the tablet initially was causing harm to the neck, shoulders and hands. After some research she found that using certain accessories, such as cases and stands, to prop up the device at a minimum 45-degree angle – helped users keep proper spine alignment and reduced strain on joints. She invested in a lightweight tripod stand with adjustable height which allows her to place the tablet at a comfortable height. Mary found general interaction with the tablet to be a positive experience. Some hand gestures such as pinching are a step too far, but she found an app which provides touch assistance for these more difficult gestures. Tapping on a tablet removes the need for mouse movements. However, for big data entry tasks Mary found that tapping puts more strain on your hands and forearms than typing on a standard keyboard. However, she found a Bluetooth keyboard which can be used in conjunction with the tablet and this helps. It’s made of silicone and rolls up and can be stashed in her bag. When the arthritis flares up, keyboard entry is not an option. Recently though, Mary discovered a medical voice recognition system for tablets and is currently trialling this. It seems to be accurate and to offer a positive alternative for large data entry tasks. See also the needs & preferences set for Mary. Text: © Copyright: Dublin Institute of Technology & Πανεπιστήμιο Αιγαίου (University of the Aegean), 2015. The text is made available under a Creative Commons Attribution 4.0 International Licence (CC BY 4.0).